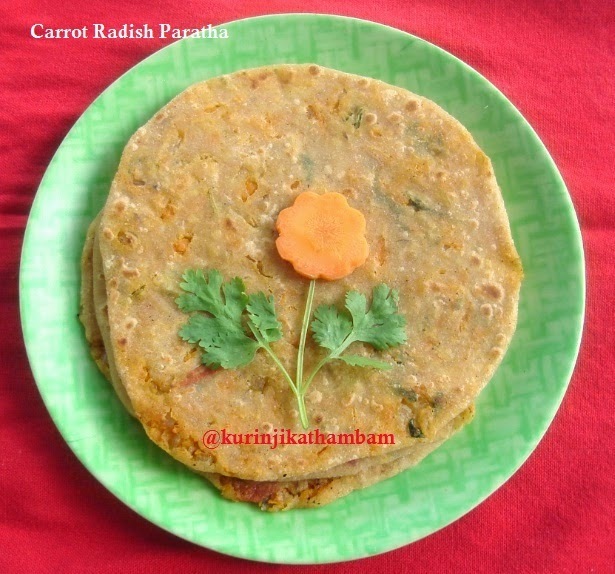 Even though Carrot paratha and Radish paratha recipes separately, Carrot – Radish paratha is a tasty combination. Carrot Radish mix gives a unique taste (sweet and salty). 2. Peel the skins of the carrot and radish. Grate them using a grater. 4. Heat 1 tbsp of oil in a pan, and add cumin seeds. Then add chopped onion and sauté until it becomes translucent. 5. Add chopped tomato and sauté till it becomes mushy. 6. Then add grated radish and grated carrot. Mix them well and allow it to cook till raw smell goes off. At this time, close the lid of the pan. 7. Next, add red chilli powder, coriander seeds powder, chaat masala, amchur powder and salt. Mix them well and cook. 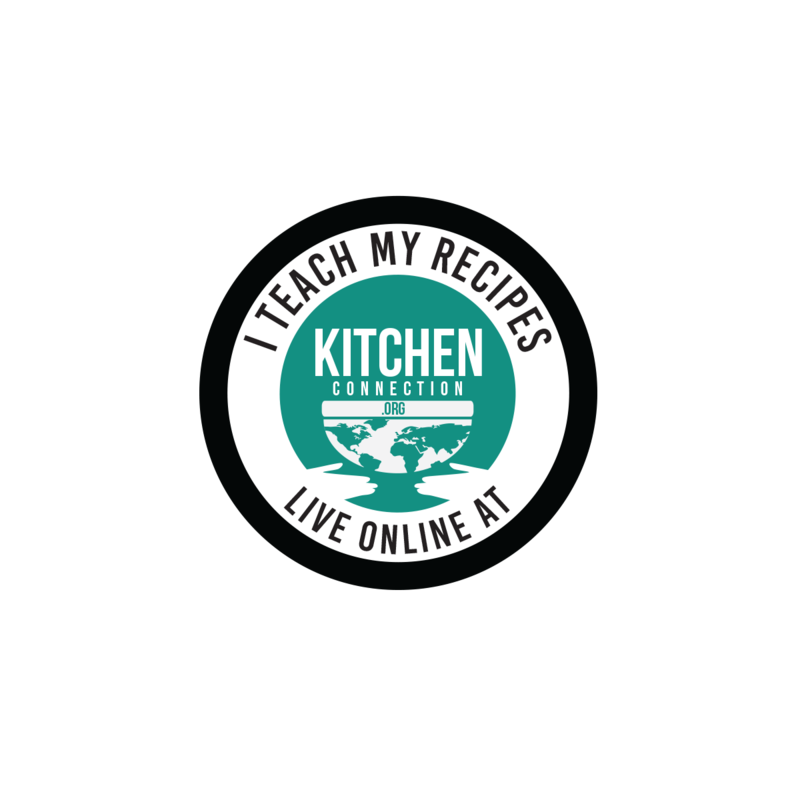 Finally add coriander leaves and mix it. 8. Now divide the dough into lemon size balls. Make the stuffing into small balls. But the stuffing ball should be smaller than dough ball. 9. Now dust the dough ball and roll it into small circle. Keep the stuffed ball in its center. Then bring the edges to the center. 10. Again dust the stuffed balls and roll it carefully. 11. 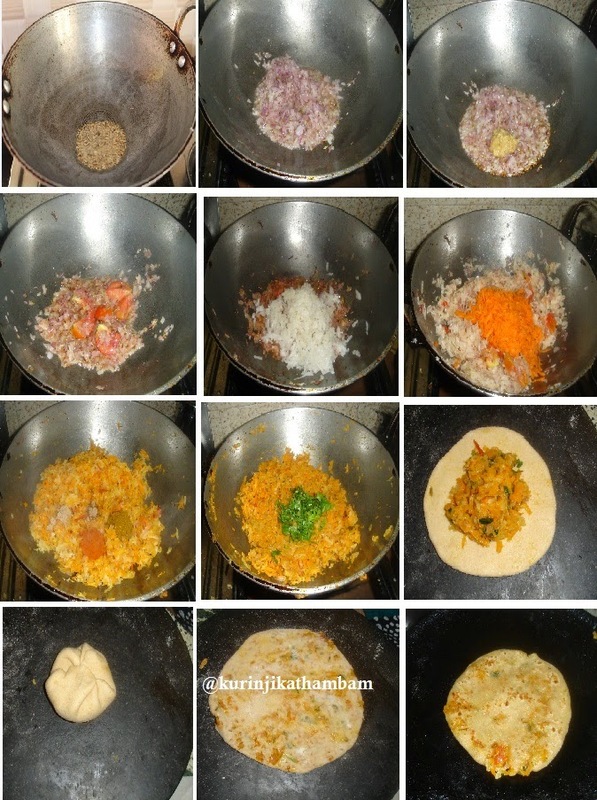 Heat the tawa and transfer the paratha, sprinkle the oil and cook both side till black spots starts. Yummy and healthy paratha is ready. Serve with raitha or chutney.